I was on the road. Ripping -- moving fast, and flowing through the crowded streets. Riding like I was on a mission! Actually my mission was a bit unclear, since I didn't know what my destination was for the day. Unfortunately, the first and second hotels I knew about were too close, and the third hotel was too far. So I figured I'd ride, and let it sort itself out. By 10 a.m. 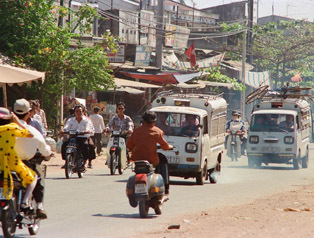 I had blasted past Ben Hoa (hotel #1), and found myself at the turnoff towards Bao Loc and Dalat. This was a tougher decision. I could continue past the turnoff and hang in Xuan Loc (hotel #2) or I could continue. 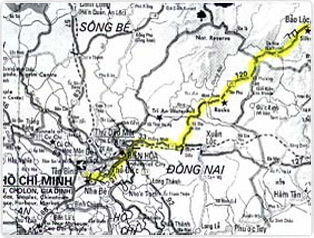 Xuan Loc's 75 kilometers from Saigon, which is fine for the first day, and getting a rythmn down, but the last 15k is in the wrong direction. So if I sleep in Xuan Loc, then it's still 135 k, and a climb, to Bao Loc. Because I dreaded the idea of hanging out in some Godforsaken town for the whole day, I elected to continue, knowing that I wouldn't make it to Bao Loc and the next hotel before nightfall. About ten minutes later a motorbike pulls up to me. "My names' Bill. What your name?" We continue the give and take. Duc offers me his shoulder, and I accept, reaching out to grab on. 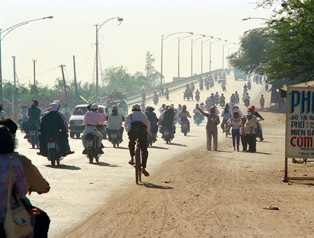 This is a common sight in Vietnam -- motorized bikes helping the non motorized ones. Duc turns out to be an interesting guy. He's a teacher in one of the villages up ahead, and thankfully his English goes beyond the standard inquiries. He is heading back home after taking care of some business in a different community. I tell him about what I'm hoping to do, and he laughs at the strangeness of it. I ask him about what's up ahead for me. Apparently it's pretty flat until Da Hoa, but then it starts to climb. That's still 100 k away, so I decide to worry about that when it comes. Duc wants me to meet his family, in the next town, and I accept, although warning him that I can't stop long. About ten minutes later we pull over, and five children run over. They're all his. A woman comes from the back room holding another child, and that too is his. We trade addresses over colas, but then I explain that I must continue. It's now midday, and we're about 10 degrees above the equator, but today I've got to keep moving. I slather on sunscreen repeatedly as the day goes on. I keep moving. I buy new bottles of water for the bike, and scarf down cookies and baguettes from roadside kiosks. The sun's no longer overhead, and I'm not seeing as many vehicles as I did earlier in the day. I start climbing, and the temperature suddenly drops ten degrees. It's just after four now, and I've got two hours until the sun sets. Lonely Planet mentioned that the sun sets quickly near the equator, and they weren't joking. Now I'm thinking about what the wild card will be that will get me out of this interesting situation. Although I haven't seen one of the always overcrowded local busses for some time now, I know that there has to be one or two more making this run, and they've got to stop for the strange white boy on the bike. I've been climbing for just under an hour now, and my savior appears. It's a large truck, struggling to pass me. I wave to the person leaning out the passenger side, and make a grabbing motion. He knows exactly what I'm hoping for, and he waves for me to catch up. I grab the edge of the left rear of the truck, and lock my knuckles, clinging to a 1.5 inch lip. My legs are overjoyed at the break, but my arm and fingers have their doubts. I have no choice -- I cling for dear life. Almost immediately we pass a Bao Loc: 20 marker, and I realize that I made it about 160 k, with baggage, and some climbing. Wow. Minutes are dragging like hours, but I'm getting up this stupid mountain. Just when I'm at the point where a different solution is going to be needed, the truck pulls over. We're at some sort of cool-down area for vehicles. There's a beverage stand too, and I'm elated -- my water had run out at the beginning of the climb. I gesture to the drivers, asking if they'd like a drink. They gesture that they're continuing on. Bad news! I think fast. "Bike on roof? ", I gesture, and they nod "sure". One man gets on the roof of the cab, and I lift the rig over my head. As he pulls it up, I scamper up the cabside ladder, trying to help with the 60 lb. load. There's a baggage rack on the roof of the cab, and with my panniers already locked to the bike, it takes only a moment to lock the bike to the rack with my chain lock. Moments later we're all in the cab and off. I'm so grateful, and they know it! They seem quite pleased too, maybe because I'm so wired, but probably also because the strange white guy with the bike on their truck will make a good story. 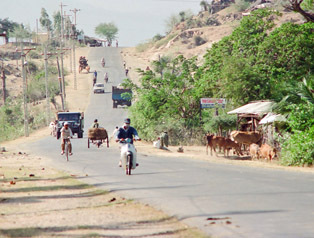 The road continued to climb and wind about for a few more kilometers, then in flattens out. We're passing through a town now, and I point out a hotel sign that we cruise by, a little concerned about why we're not stopping. A few minutes later, we pull over. They point to a building on the other side of a small lake. "Otel", I'm told. The place looks like a resort compared to the small roadside hotel I had spotted earlier. I don't care. I'll pay the price. I thank them, get the bike off the roof, and offer some money. They wave me away, smiling. 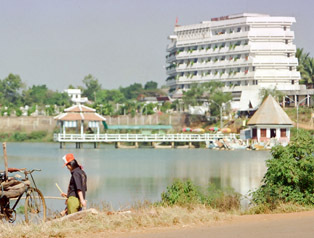 I pedal around the lake, and stop at the edge of the hotel's property. I'm a mess. Greasy sunscreen has helped bond twelve hours of dust and diesel fumes to my white shirt. I change to my other shirt, so the hotel staff won't turn me away. When I enter the hotel, I'm greeted in English, and welcomed. Twenty-three dollars gets me a very nice room, with a refrigerator and satellite TV. Wow. I try to shower off this amazing first day. 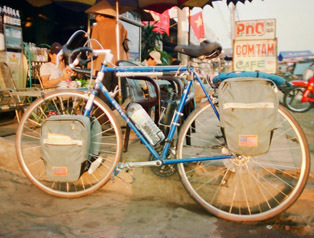 Dalat, the next town known to have a hotel, is another 118 k, and a known climb, so I settle in -- I'm not moving tomorrow! The Bau Loc Hotel: an oasis in the middle of nowhere!